Let’s be honest, when the topic of printer ink comes to mind, your health and safety are probably rather low on the list of concerns. Top on the list is most likely cost, availability, print yields, or even selling them for cash. The truth is, the overwhelming majority of ink and toner products are manufactured with strict adherence to industry standards and safety guidelines. While most printing inks and toners are considered non-toxic, the contents vary by brand and product, so it pays to educate oneself about the contents of printer cartridges and toners. What’s In Your Printer Ink? The primary ingredients in most printer inks are water, ethylene glycol and alcohol. Nothing toxic per se, but ingesting it can definitely make you sick. However, the photocopiers and laser printers used in most office environments don’t use liquid ink. Rather, they are made with a fine powder called toner that they melt onto the paper. 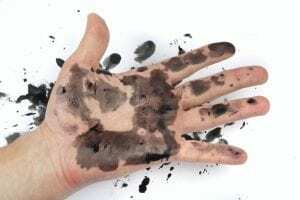 Toner does contain compounds that are potentially dangerous in large quantities but are certainly considered safe in the quantities one is normally exposed to in an office. The actual toner cartridges are also considered to be safe in general, but if they become damaged or broken, they can release harmful toxins found in the toner powder. The chemical called carbon black that is used when creating the powder inside toner is known to be a carcinogen. Some toners also contain small amounts of iron. Bottom line? It’s a good idea to take precautions when handling and using toner, printers, and other office equipment. Better to play it safe—use protective gloves whenever changing the toner ink in any of your office equipment or disposing of old toner ink cartridges. Carbon black inhalation can cause headaches, eye irritation, chronic itchiness and small growths on the tongue. Direct contact with the skin may result in mild to severe irritation, so why take the chance. Keep a box of disposable protective gloves near the printer supplies as a reminder. Another important factor to minimize any health concerns is to ensure the ink and toner you are buying are brand name, authentic products and not repackaged or generic formulas. This will greatly reduce incidents of damaged toners and any associated risk of coming into contact with toner powder. All major brands of ink and toner cartridges will have a Material Safety Data Sheet that can be referenced for any known hazardous contents.